The days are getting warmer and we’re starting to think about our spring and summer gardens. How about planting a garden you will use to make your favorite Mexican dishes? Check out this Chilies Rellenos Garden idea from Bonnie Plants. Come see us for your garden plants and supplies. Give your next batch of chiles rellenos — a classic Mexican dish starring roasted, stuffed poblanos often served in tomato sauce or salsa — a super-fresh flavor boost with ingredients picked from your very own garden. All you need is a little bit of space and you can grow all the poblanos, tomatoes, oregano, and onions you need for a summer’s worth of this delicious dish! If you want to expand your garden, place two 4 x 4 beds symmetrically on either side of a 3- to 4-foot path, which should be just wide enough for you and your tools. Take inspiration from these planting options, but feel free to mix things up a bit based on your tastes. These plants are pictured small to make the illustration simpler, but your bed will be spilling over as the plants grow! 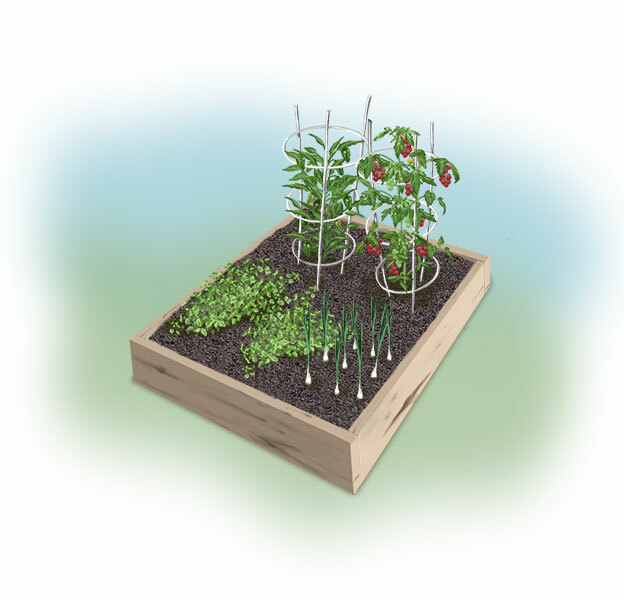 Following the spacing guidelines found on the individual plant tags (you can add a few more plants than we have pictured if space allows), and know that you’ll need cages for the pepper and tomato plants. This entry was posted on Thursday, February 20th, 2014 at 2:55 pm	and is filed under articles, Garden, News & Updates. You can follow any responses to this entry through the RSS 2.0 feed. Both comments and pings are currently closed.